Jens Ludwig speaks with reporters. Alumnus Masaaki Shirakawa (A.M.,’77) was featured in several newspapers Thursday, April 10, including the Chicago Tribune, which reported his confirmation as the Bank of Japan’s new governor. 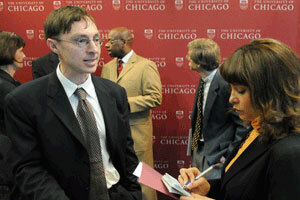 The article noted Shirakawa’s University degree and his Chicago School of Economics training. Shirakawa got his master’s degree in economics in 1977, when Milton Friedman was a dominant presence at the University, the article noted. What Shirakawa brings to his new job from his school days is a recognition that well-functioning markets are at the heart of a well-functioning economy, said Jacob Frenkel, one of his former Chicago professors, in the article. Genetic research conducted at the University—in which a gene variant was found to be responsible for an increased risk for asthma, bronchial hyper-responsiveness and a decline in lung function—was published in the Thaindian News, a publication in Bangkok, Thailand. Carole Ober, Professor in Human Genetics and the College, and lead author of the study, which was published in the New England Journal of Medicine, said the discovery of the variant is exciting because it connects asthma susceptibility to a new pathway at the protein and genetic levels. “This is also the most significant genetic discovery based on our years of gathering data on asthma in the Hutterites. This is a group with enormous potential to advance our understanding of the genetic underpinnings of disease. We now have a remarkable collection of data, which we expect will lead us to many more insights.” The Associated Press also carried an article about the genetic discovery on its newswire Friday, April 11. 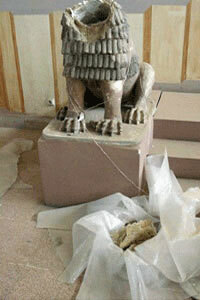 The remains of a damaged terra cotta statue of a lion (ca. 1800 B.C.). Stories about the new exhibition, “Catastrophe! The Looting and Destruction of Iraq’s Past,” at the Oriental Institute Museum, appeared in multiple publications and were carried by the Associated Press and Canadian Press newswires. The damage to archives at the National Museum of Iraq in Baghdad and the loss of stolen artifacts are central to the exhibition, which includes documents and photographs that show the destruction of archaeological sites in other regions of Iraq. Geoff Emberling, Director of the Oriental Institute Museum, noted in a Chicago Sun-Times story that thieves have destroyed many sites. “Holes are 10-feet deep. It’s like the surface of the moon,” he said. James Madara, C.E.O. of the University of Chicago Medical Center, Dean of the Biological Sciences Division and the Pritzker School of Medicine, and Vice President for Medical Affairs, was interviewed for a story published Monday, March 31 in Crain’s Chicago Business. The article reported the University Medical Center is funding the expansion of Access Community Health Center, a South Side clinic, to help treat a rising number of poor patients in need of routine health care. “We were just passively taking care of whatever showed up at our door when they were things that could be handled by community hospitals. We were eroding their base business while also making it more difficult on ourselves to serve our unique function,” said Madara.